Exceptions: not much Ed Wood-style hand acting, but Lugosi is a striking figure in wide shots and close-ups. Dwight Frye as Renfield starts out as your standard easily-amazed eyeliner-wearing actor, but turns into a creepily intense giggling psycho after being bitten. He’d play Fritz (the sidekick mistakenly known as Igor) in Frankenstein the same year. And there’s a surprising scene at an opera, where Drac first meets our heroes and has a sober line about fates worse than death, giving an edge of unfortunately-tortured-soul to his standard murderous-villain role. Tame: no fangs, no bite marks, and needless to say no blood. No score, either – some scenes are conspicuously quiet, lacking any sound effects for minutes at a stretch. No money at Universal to film the storm at sea during the crossing from Transylvania to London (one of my favorite parts of Herzog’s Nosferatu) so they used a scene from a silent film, comically sped-up from 18fps to 24. It works, though, making the scene more intense (it’s the biggest action scene in the entire film, and it’s stolen). Renfield, not Harker, visits the castle at the beginning, gets turned (halfway?) 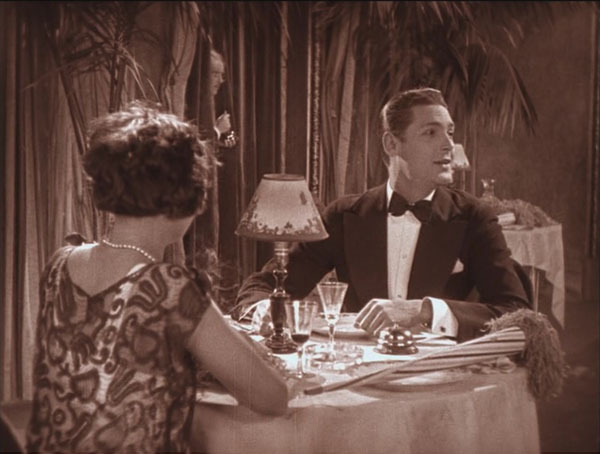 and helps Drac move to England where he meets useless, boring Harker (David Manners would costar with Lugosi and Karloff in The Black Cat) and his girlfriend Mina, along with Mina’s dad and friend (?) Lucy. He goes about his business draining blood from the girls until family friend Van Helsing (Edward Van Sloan, who appeared in Frankenstein and The Mummy) catches on after Lucy’s death. VH runs down Drac, catches him burying Mina (? ), chases him into the castle and pulls down the curtains as the sun rises, turning the vampire to ash and freeing Mina. And Universal stood behind that death – Dracula wouldn’t appear in any sequels until the mid-40’s. Lugosi wouldn’t even fare as well as his most famous character. He’d play Dracula in one more film, Abbott & Costello Meet Frankenstein, before ending up in Ed Wood hell and giving Martin Landau an oscar. Mythology: They’ve got the no-reflection thing, the turning into bats and wolves, aversion to sunlight and crosses, wooden stakes through the heart, but Drac can enter a room without being invited and vampires avoid wolfbane, not garlic. Karl Freund, formerly F.W. Murnau’s image-man in Germany, would go on to shoot most episodes of I Love Lucy. 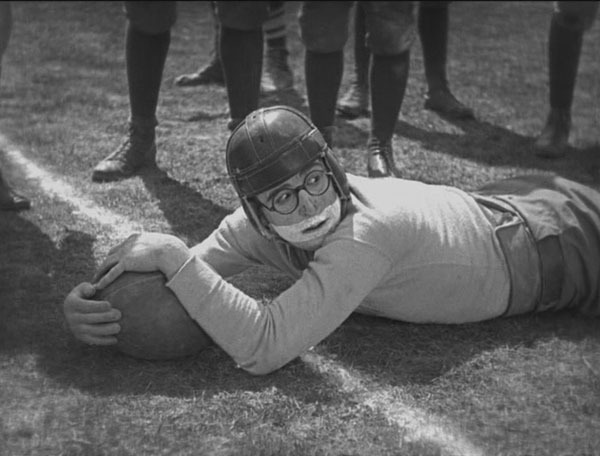 The sad truth about Harold Lloyd is that I loved him when I first saw him, but every time I rewatch a movie I like it less. So far I’ve seen Safety Last! and The Freshman twice, and each dropped from “great” down to around “pretty good”. I’m afraid to rewatch the ones I thought were pretty good to begin with. Young Harold (he was actually 32) watches imaginary film The College Hero over and over to prepare himself for college, filling his head with stupid ideas about college life. I would’ve loved it if they’d done more movie-vs.-reality comparisons, but it seems the only thing he took away from the film was the hero’s nickname (“Speedy”), catchphrase (“I’m just a regular guy”) and silly jig, which everyone at college mocks until Harold manages to win the big football game, then the jig becomes the coolest thing. It’s a wonder that nobody else at school had seen this movie and figured out Harold wasn’t even an original nut, just a nerdy guy ripping off a bad movie joke. But my biggest surprise was finding that the silly hat Harold wears wasn’t an invention of his silly movie – college kids (according to this silly movie anyway) actually wore those hats! Below: Harold and “the college cad” in silly hats. 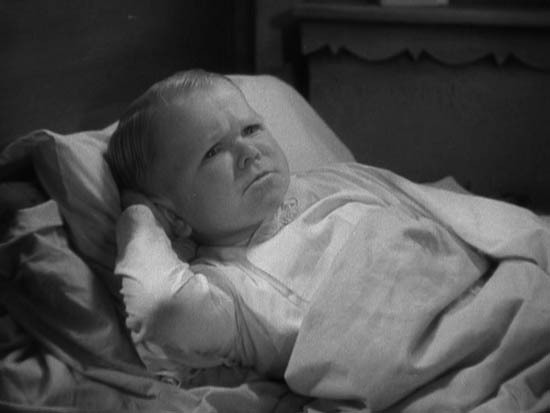 The cad, Brooks Benedict, later appeared in Leo McCarey’s not-sequel The Sophomore. In the scene below, Harold’s tailor hides behind a curtain, ready to patch Harold’s unfinished suit should the need arise, but the two get their signals crossed because of a dude at a table ringing a bell. Supposedly the bell ringer is Charles Farrell, star of Street Angel, but he sure doesn’t look like he does in my screengrabs from that movie. The girl who likes Harold, cutie Jobyna Ralston, was in The Kid Brother and Wings, didn’t make it in the sound era. Written by DW Griffith and Tod Browning, the same year they did Intolerance, and co-produced by Keystone. Douglas Fairbanks was apparently famous enough to play himself in a framing scene – I think he plays himself, and the rest of the film (starring himself) is his rejected pitch to a producer for a film to star himself. That’d already be plenty to wrap one’s head around for a 1916 short, but that’s before we even get to the main story, which involves incompetent and extremely drug-addicted hero Coke Ennyday trying to stop criminals from smuggling contraband via one-man inflatable toy rafts, and stop the criminal mastermind from forcing the lovely Fish Blower to marry him. Coke gets the drugs and the girl, and I didn’t know I could have my mind blown by Douglas Fairbanks. 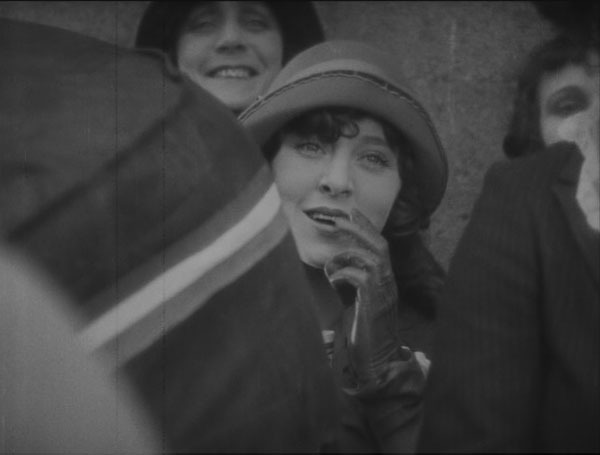 Bessie Love, the Fish Blower, appeared in three major films in the early 1980’s, sixty-five years after this one. I wonder if anyone on those sets asked her about her cult druggie silent short. 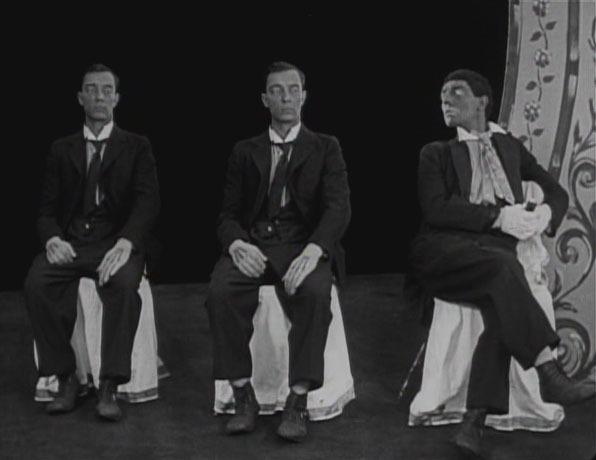 I’d seen almost all of Keaton’s solo silent shorts, but I’d missed this major one, in which he plays all the characters in a trippy dream sequence that lasts the first half of the film. 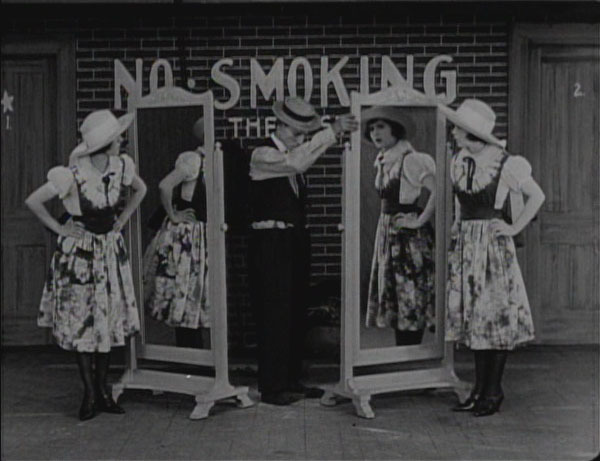 Reliable heavy Joe Roberts finally wakes Buster from his funhouse-mirrored delusion and he goes to work as a stagehand, where he’s spooked by a pair of identical twins with mirrors. A sheer delight of visual invention only grudgingly held together by a plot. 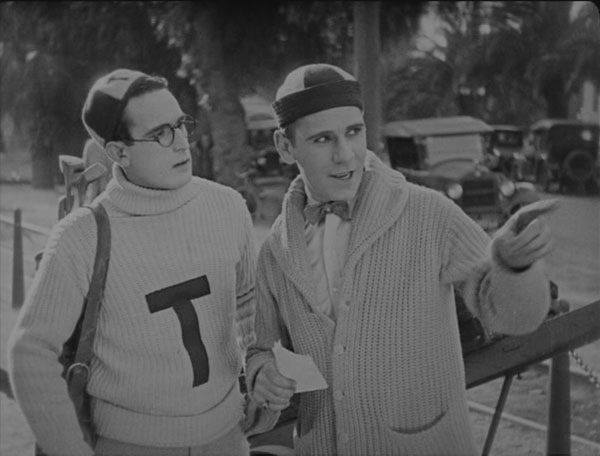 The Freshman was a movie about a boy whose ideas about life have been warped by the movies, Leaping Fish had Douglas Fairbanks the actor playing Douglas Fairbanks the aspiring screenwriter, and The Playhouse featured Buster Keaton playing a hundred of himself in a stage performance viewed by even more of himself. Cops has no self-conscious reflection that I can think of. It’s just a damn fine heist/love/chase flick with great invention in props and situations. However it does fit in with the outrageousness of last two films in its ending: snubbed by his intended love, Buster effectively commits suicide by running back into the police station where he has just locked up hundreds of angry cops. 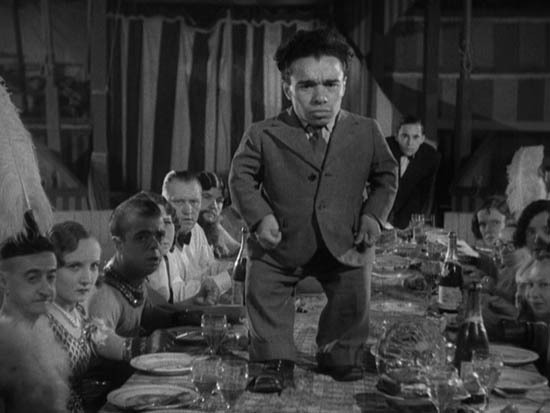 I was gonna go on about similarities between Gordon/Mamet’s Edmond and Freaks, but I guess that doesn’t make much sense. Katy is hung up on how the freaks turned the wicked trapeze artist into a chicken lady, but it is a “horror” movie, so we’ll just say the Human Torso has transformative magical powers. 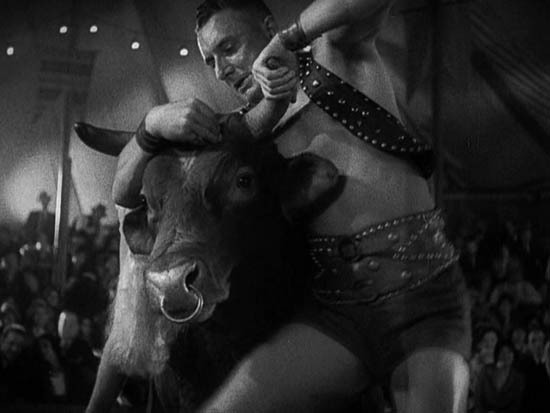 Wallace Ford (Phroso the clown) was in tons more movies, incl. Anthony Mann’s Man From Laramie and Hitchcock’s Spellbound. Good-girl beauty Leila Hyams was in Buster Keaton’s Spite Marriage, Browning’s 13th Chair, Leo McCarey’s Ruggles of Red Gap, then she never acted after 1936. Evil trapeze girl Olga Baclanova was in The Docks of New York and not many sound films because she moved to Broadway for a decade before retiring. Hercules Henry Victor got huge in the 40’s playing evil nazis in every Hollywood movie that would take him before dying of a brain tumor in ’45. Short couple Hans and Frieda were actually siblings. 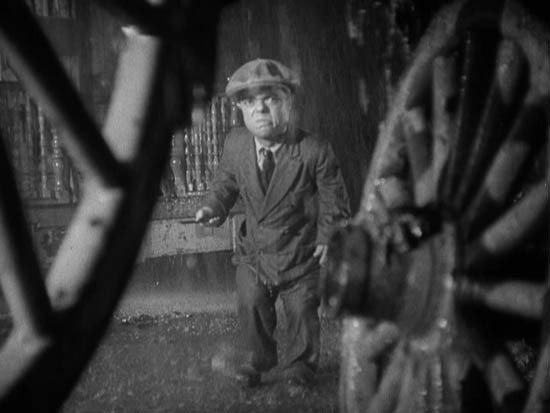 He was in Browning’s Unholy Three and both of them were munchkins in The Wizard of Oz. Those twins actually were conjoined. The human torso was sixty-one when the film was made! One of the greatest weird movies everywhere. Rob Zombie loves it.